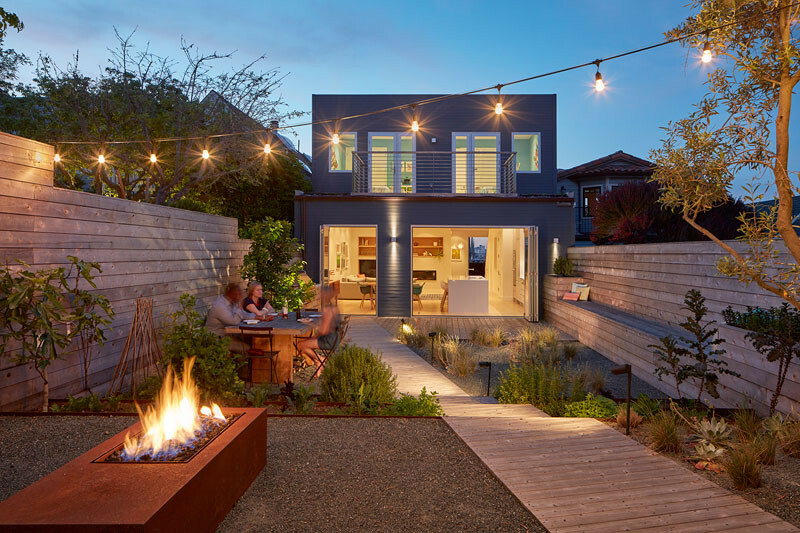 “Give us an urban oasis, something minimal and modern but warm with a seamless flow from inside to out”, that was the mandate from the clients, a family of four, to the architect, for this San Francisco home remodel. 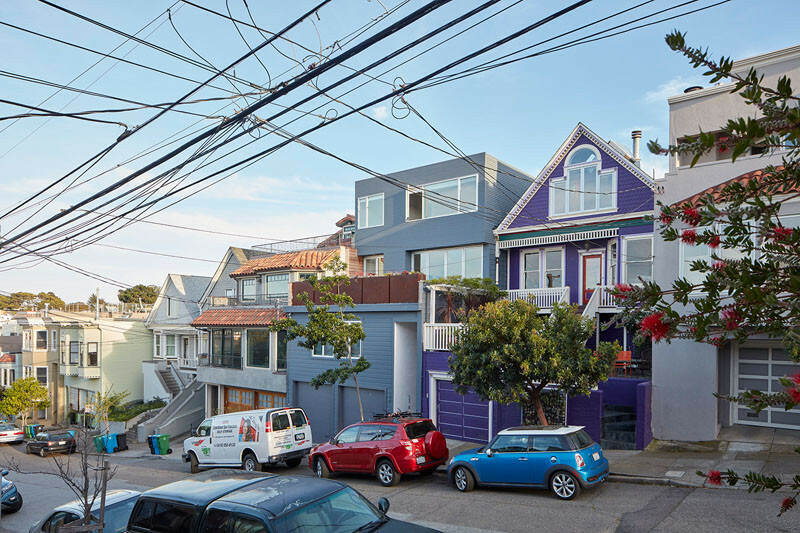 The existing house did not have a usable top floor, so YAMAMAR Design Architects added a third story, freeing up the main floor for open plan living, dining and entertaining. There’s also an in-law unit tucked away above the garage. 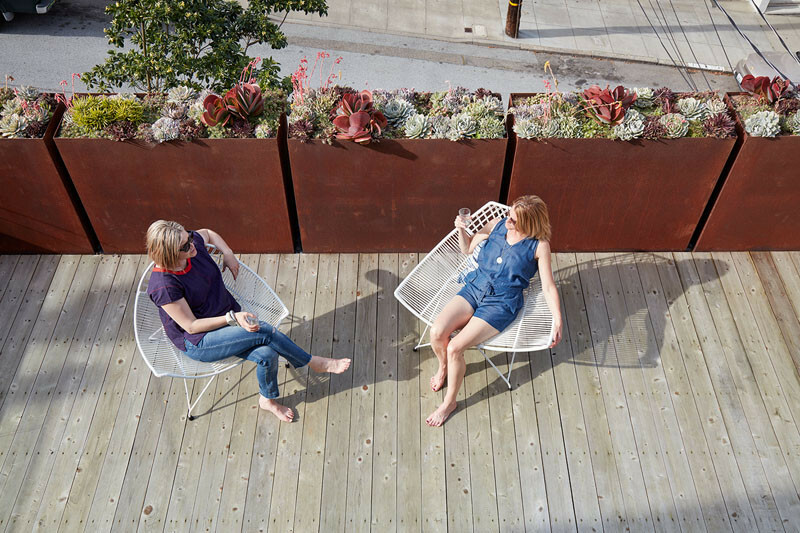 YAMAMAR Design Architects worked together with landscape design firm Terremoto, to design the backyard. 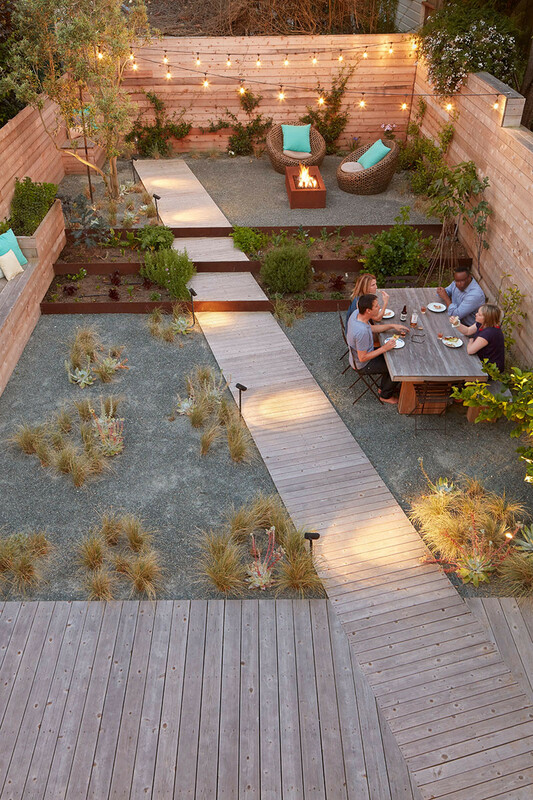 The fully landscaped backyard has had the space split up into various sections, like dining, socialising, and resting. 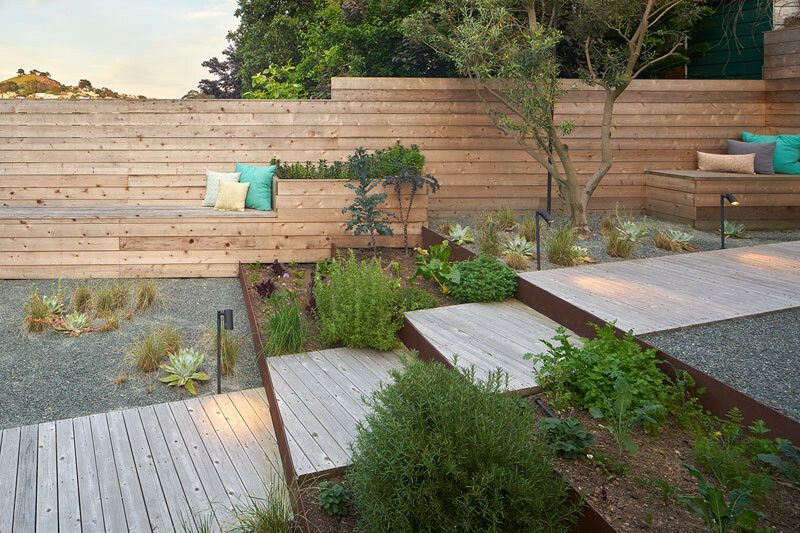 Along one side of the backyard, is a wood bench, that almost runs the entire length of the space. 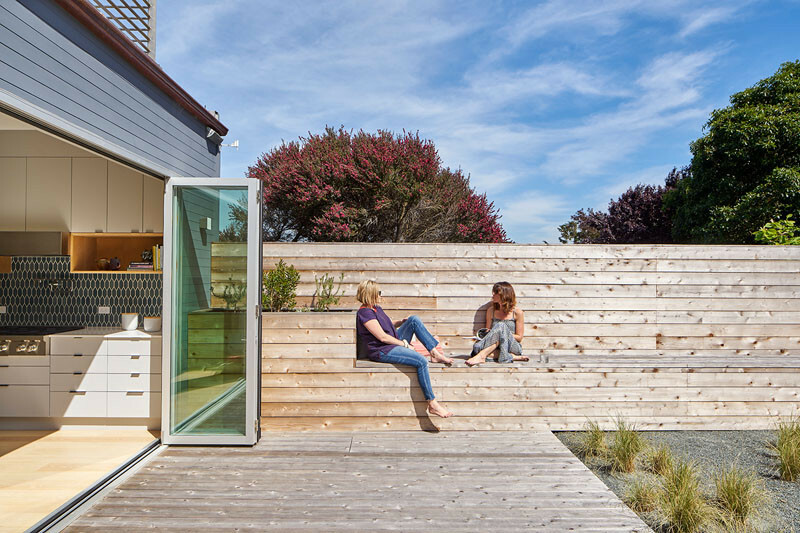 The bench leads you directly into the kitchen. 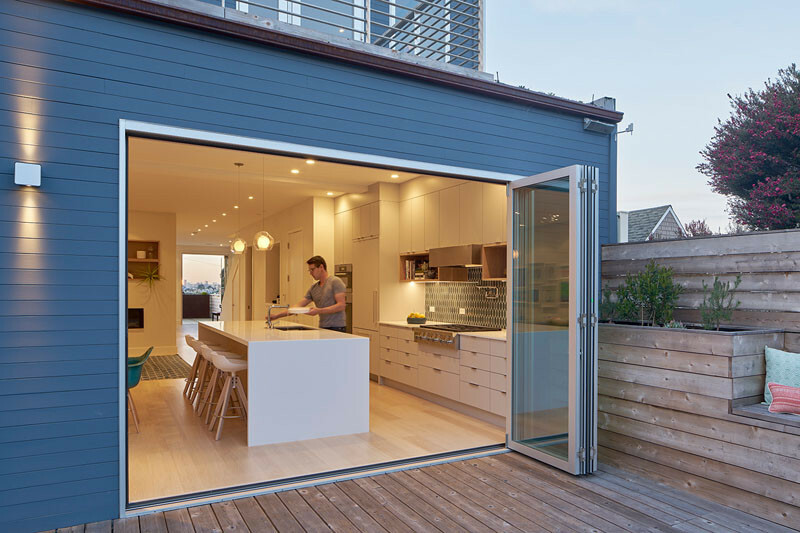 Folding doors open directly onto the backyard, essentially extending the kitchen area, especially with access to the BBQ. The diagonal path in the backyard lines up perfectly with the door to the inside. 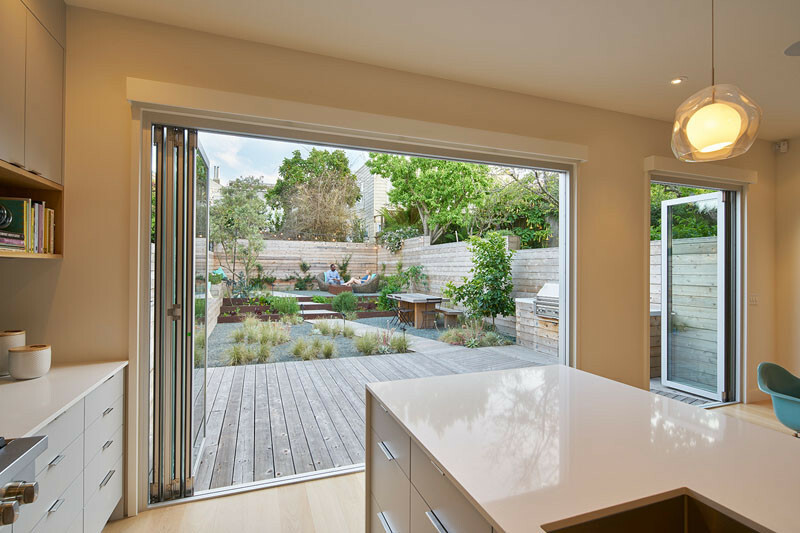 Here’s a look at the LaCantina® folding doors. 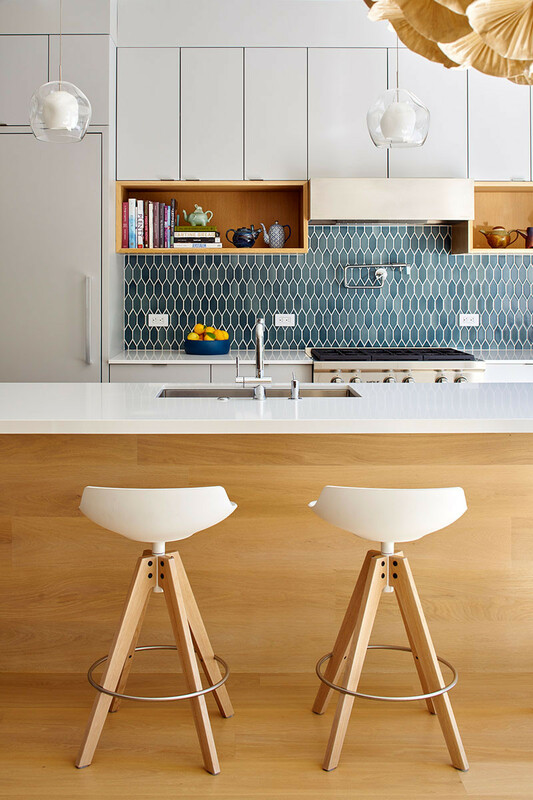 In the kitchen, blue tiles add some color to the white and wood kitchen palette. 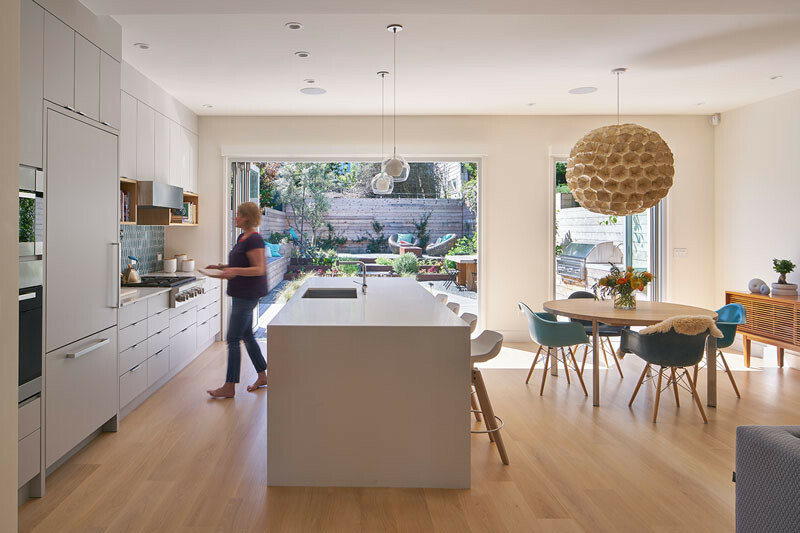 Next to the kitchen is a circular dining table and chairs, with a large sculptural pendant light. 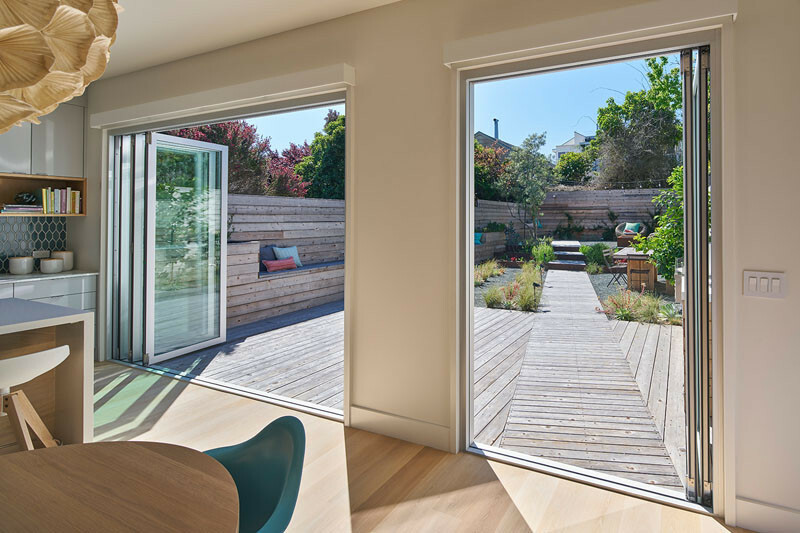 From the front of the home, you can see through to the backyard. 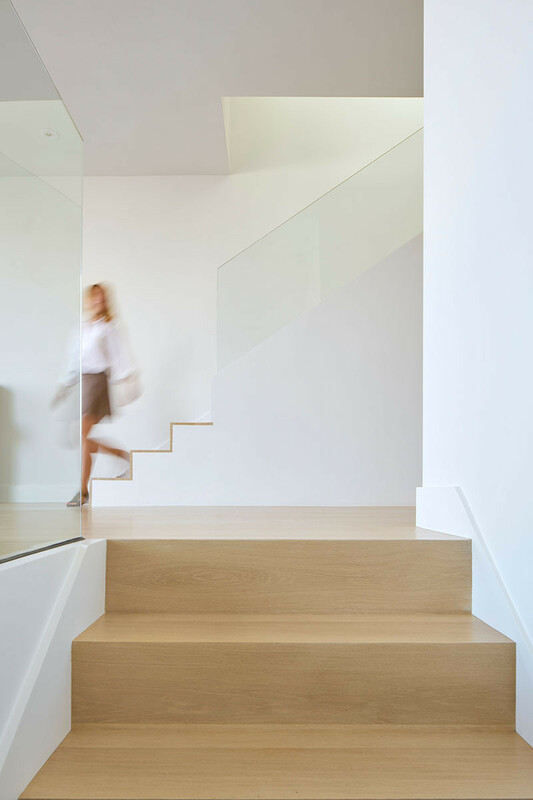 Wood and white stairs lead you to the different levels of the home. 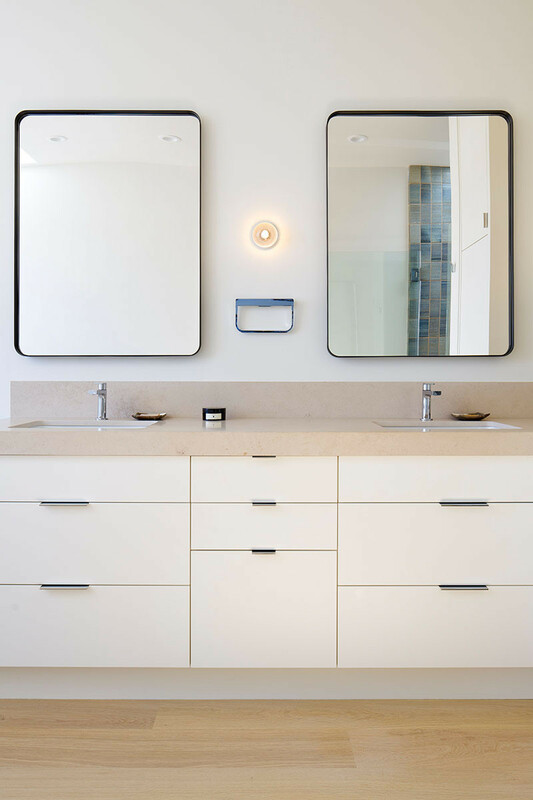 The architects worked with Alison Damonte Design to complete the interior design of the home. 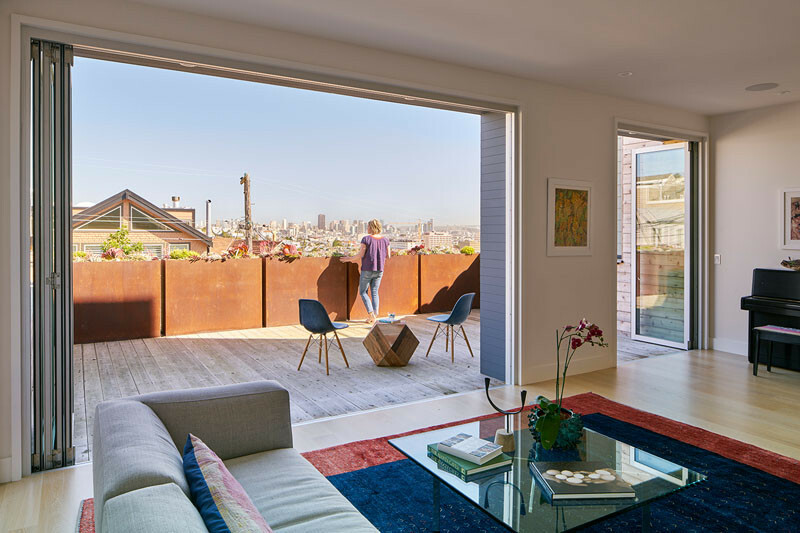 Off the living area there’s a deck with views of downtown San Francisco. 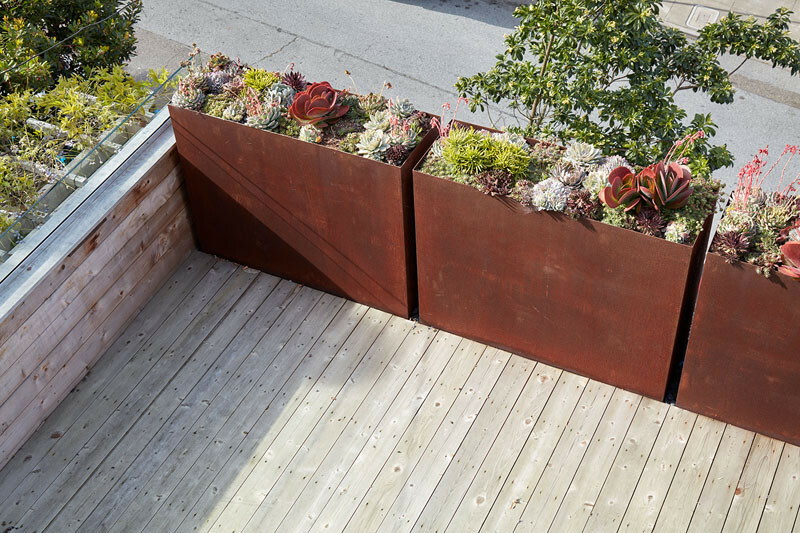 Weathered steel planters line the deck and are filled with succulents. Throughout the home, wide plank engineered white oak floors have been installed. 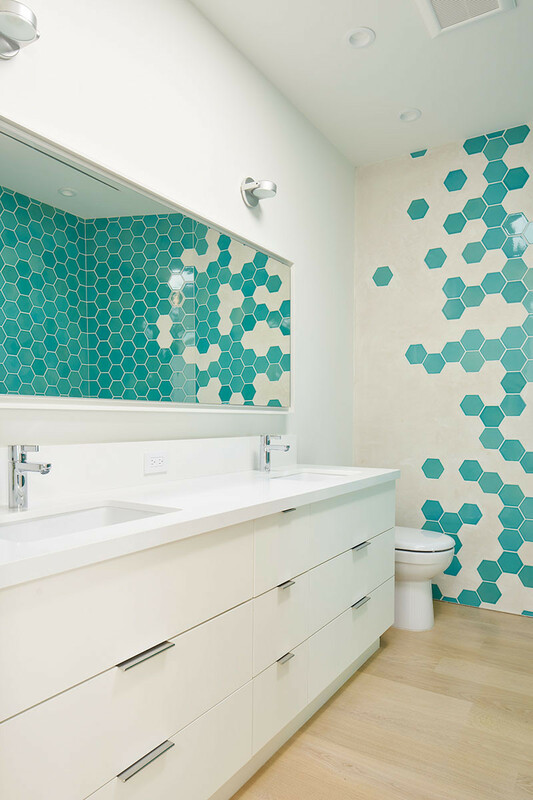 Blue hexagon tiles add some color to this otherwise white bathroom. 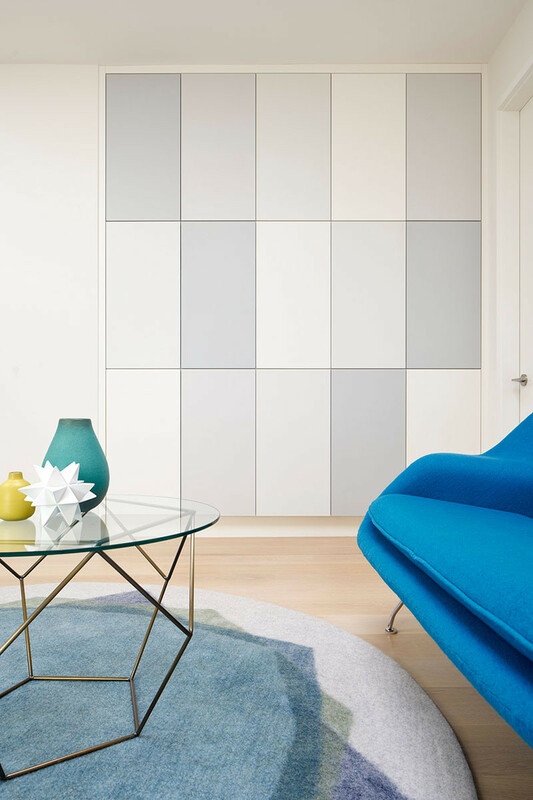 The hexagon theme carries through to this bedroom, with the colorful hexagon shelves on the wall. 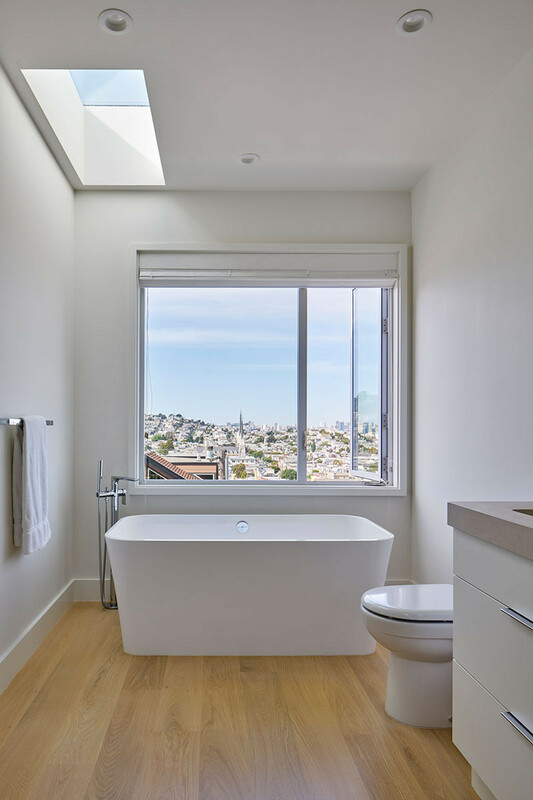 The bath has been positioned to take advantage of the view. At the other end of the bathroom. 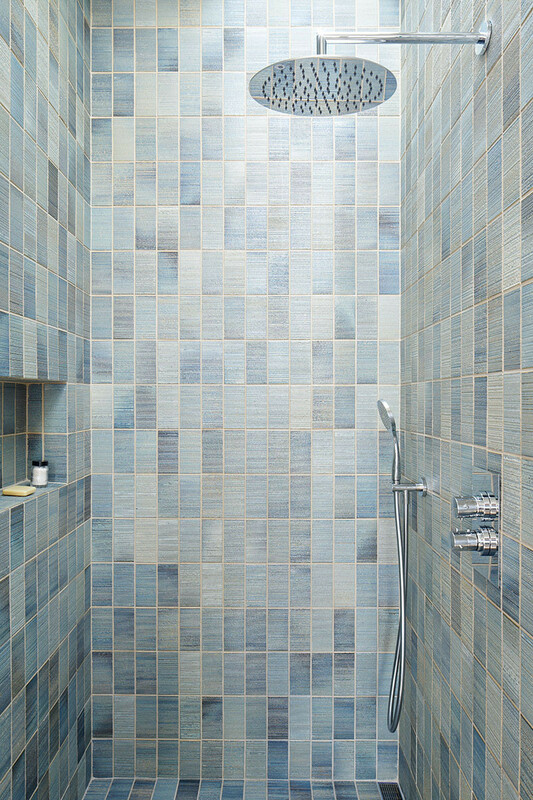 soft blue/grey tile covers the walls and floor of this shower.